Two AM. One hundred feet above the desert, one hundred knots. A darkness so complete that the goggles sparkle. There isn't enough ambient light for the tubes to intensify, so they make visual static. 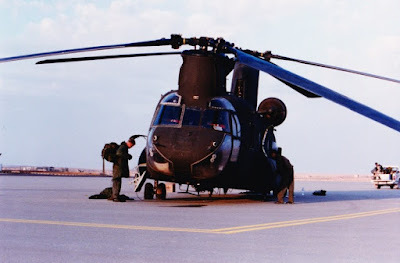 I am flying a Chinook, with a pilot next to me, another in my jump seat, and a mix of Army Special Forces and Air Force PJs riding in the back. On the ramp, I have two experienced crew members, and in each forward side window a young enlisted "gunner" sits ready. We are heading from KKMC to Rafha to sit "Fat Cow" standby, with tons of jet fuel to give to other helos, or tanks. Our internal tanks have a placard that plainly reads "Not crashworthy, not to be used in combat." But combat changes the rules. I can barely keep my eyes open. The excitement and anxiety of going to war for the first time had kept all of us awake for most of the day prior. We are well south of the border between Saudi and Iraq, and although we know trouble may come later, not one of us anticipates trouble now. We have our position lights and anti-collision lights on, and are following a route flown repeatedly by Andy and his crew the night prior as they set radar reflectors for inbound airstrikes to use as a final position fix. From the ramp, Mig's voice, "BREAK LEFT BREAK LEFT MISSILE MISSILE MISSILE." I hear this, understand what I have heard, and do absolutely nothing. I hold what I got, frozen in disbelief. Across from me, Russ says "I have the controls," and he begins a gentle turn up and left. We are four thousand pounds over max gross weight in a self-propelled fuel-air explosive and we aren't going to do much hooking and jinking. From the jump-seat Don commands, "break phase and break plane, you gotta break phase and break plane!" Don has been to the Marine Corps' WTI course. I have not. A brilliant flash turns night into stark daylight, and I know I am a dead man flying. My goggles shut down, I look up under them and see the desert floor below us, shadows lengthening as the source of light falls. It isn't a rocket killing us, its a flare (from us?). At that instant, both pilots and one of the two gunners (the one who hadn't launched the flare) realized that we had flare launchers and we all started pushing our flare buttons. Luckily, there is a time delay in the system, or we would have salvoed the canisters. We lumber through some turns, climbs, descents, and Don says, "you need to land and let the guys in back kill these dudes." As no one else had any better ideas, and the "missile" calls kept coming, Russ lands the helicopter; hard and fast. A massive cracking sound resonates through the airframe, and it bounces nose-up and rolls right. We crunch the right rear gear into the rocky floor. Now we can't land here. God Bless those Lycomings. They screamed at the torture, but pulled us away. We lived through this experience, twenty five years ago now. I have had tons of time to reflect on things that went right and things we did wrong. It was our first time, and we were all new at getting shot at. For years, we thought they were shooting SA-7s at us; those unseen men in the desert. Later wars have indicated that they probably had RPGs, still deadly at close range, but nothing like the SA-7. The crew on the ramp could only see the flaring, streaking objects. We in front couldn't see anything. Rich Dewald probably saved everyone when he said, in an angry tone of voice, "okay everybody calm down, they aren't anywhere near us anymore." If only we had had combat training... If only we could have been subjected to that scenario before encountering it "for real." 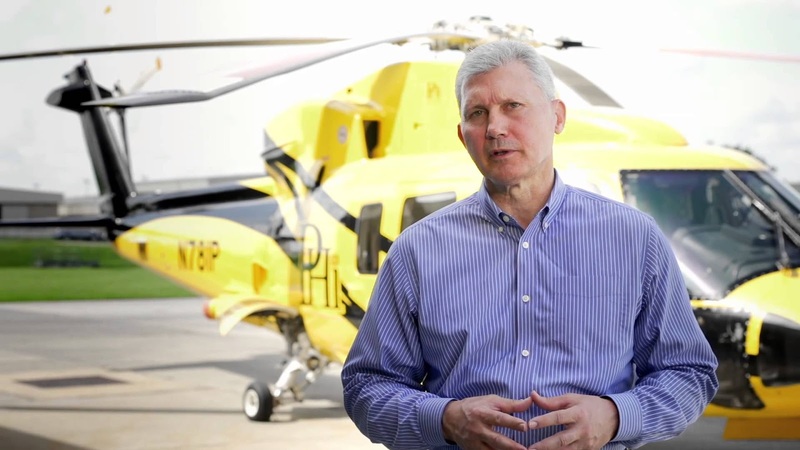 Just over a year ago, the National EMS pilot's association was invited to participate in a rule-making advisory group for new HEMS training rules. NEMSPA sent me. Training should take into account what we have to do, and what might happen to us while we are doing it. Training should be evidence-based . What is killing us, and how do we stop it? Training should be designed not simply to expose us to new situations that we may have never encountered before, but also to reinforce proper behavior. It should be conducted to the point that when faced with an in-extremis situation, the response will be automatic, conditioned, without thought or hesitation. I think the SF guys called these "battle drills." They trained under fire, so that when they came under fire they would act instinctively. While in the aircraft, in a downwind at an airport, the instructor will announce "you have an engine failure." The rated-student-pilot will successfully adjust cyclic and collective to enter an autorotational flight profile, will complete a 180 degree turn into the wind, and will position the aircraft such that a successful landing could be completed. The success of the maneuver must never be in doubt and the RSP must be the obvious master of the aircraft. If not able to reduce engine power, discussion of the maneuver will include what an actual loss of power will sound and feel like. The topic that kept coming up during the meetings was the cost of training. No one wants to be subjected to higher training costs. But consider what one crash costs, in terms of negative publicity, employees who leave out of fear for their personal safety, and of course the loss of human life and destruction of aircraft. With five fatal HEMS crashes last year, it is obvious that we have room for improvement in the manner in which we prepare pilots and crews to conduct HEMS. We can either fix our problems ourselves, or someone else will do it for us. I had the pleasure of meeting Lance Bospflug at PHI Air Medical's customer support dinner during the last AMTC. Upon arrival at the venue, I headed straight to the bar for some refreshment. I found a tall, well spoken, interesting and interested gentleman standing there. He greeted me courteously - without knowing me, who I worked for, or what I did. 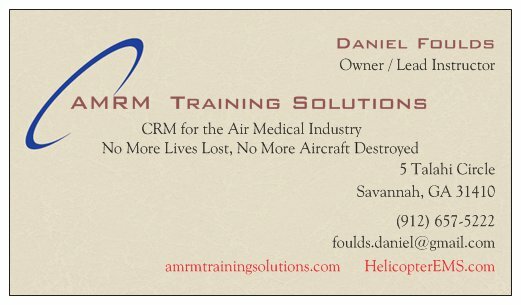 I told him I had just retired from active flying in HEMS, and was now going to focus on preventing crashes. After expressing surprise at my retirement, he let me know with warmth in his voice that my new "mission" is a good one. And now here he is, reiterating that goal himself. Later when I asked NEMSPA's president, who had invited me to this fine social function, "who is that guy" Kurt said, "Oh, just the top guy in the company..."
Charismatic leadership is transformative. It evokes an emotional response that percolates through our cognitive-self and results in desired behavior. The way people "feel" about what they are doing determines how they do it. Well done sir - well done in word and in deed. 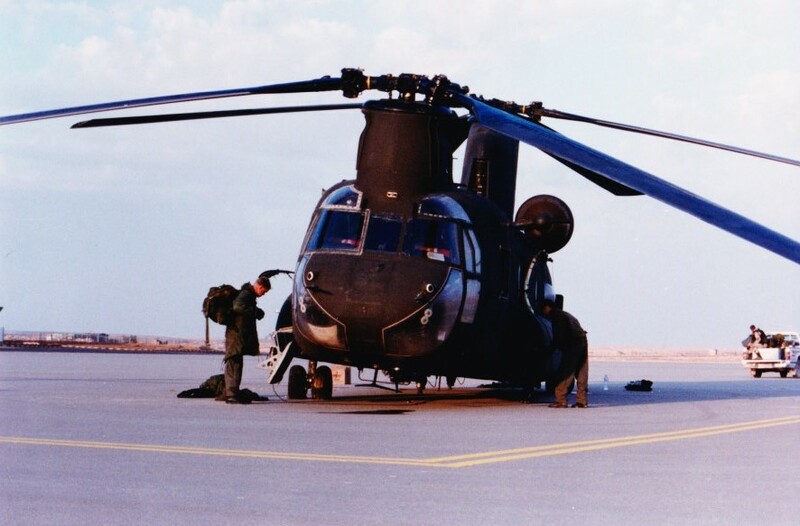 History of helicopter development and use. Circa 1958 Army Training Film. 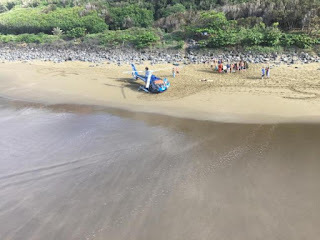 Thanks to our visitor, "Surf" for pointing this out to us at HelicopterEMS.com. There are lots of great old helicopters shown in flight in this video. Why Does My Pilot Fly Differently Than Your Pilot? True CAT A only applies to multi-engine helicopters. Notice that the departing aircraft backs up initially. Recently, a friend shared a post for our blog after observing two different aircraft departing a rooftop pad with different techniques. This led to an angry comment from a pilot; upset that HelicopterEMS.com had allowed the writer ( a non-pilot!) to share concerns about flying technique. With two fatal helicopter crashes in less than a week and five total last year, (as of the date this was written) we think it is only normal for the teams who fly in HEMS aircraft to take an interest in the nuts and bolts of pilot technique. To date, no nurse or paramedic has killed a pilot in a HEMS crash. 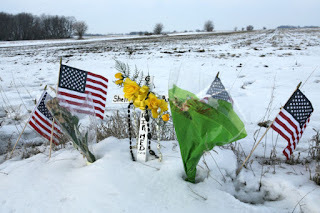 It has always been one of us pilots flying everyone to the crash site. If they didn't take an interest in why and how we do the things we do, they might be considered dumb, and they aren't. 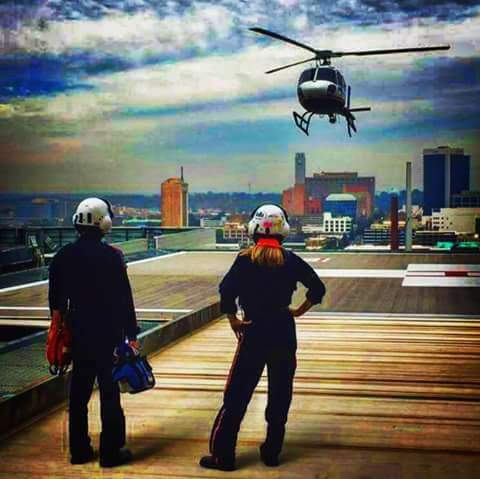 One purpose of this blog is to reduce fear, suspicion, anger, and resentment that - unfortunately - can crop up in HEMS. 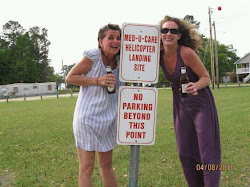 Let's consider departing from a rooftop helipad. One way to perform these departures is to lift vertically, with the departure spot beneath the aircraft, to altitude (perhaps 30 to 50 feet up), then to accelerate forward from this point in space. 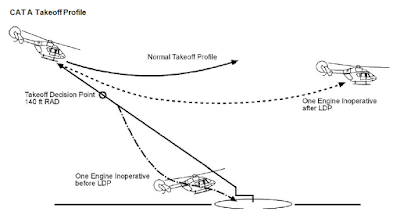 The logic of this technique is that if the aircraft loses half or all of its power while hovering over the spot, it can return to the departure point. This takeoff technique somewhat resembles the "category A takeoff" as practiced in Europe, but in most cases, pilots in America don't back up during the climb as per a real cat A. Backing up lets the pilot keep her eyes on the departure pad - but many of us hate to hover backward. This vertical technique was taught by Omniflight's chief pilot during Bell 230 transition training in 2004. It was also taught years later by an Air Methods check airman during Astar transition training. It's a technique, and like any other, it has good points and bad points. 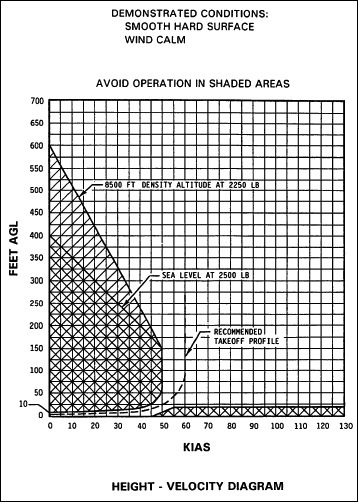 One bad point is that the aircraft is operated for a longer period of time in the "avoid" area of the height-velocity diagram, the "dead man's curve." Most of these charts look basically the same, If you look, you can see that we are supposed to accelerate to - depending on aircraft and chart - 30 or 40 knots before climbing more than 10 or 20 feet above the surface. Now, looking at the chart, and imagining us flying off the edge of a roof-top pad so that instead of being 30 or 40 feet up we are now perhaps 150 feet up, one can see that as we do this, we go further up into the avoid area and remain there until we accelerate. Probably for this reason, the FAA's Helicopter Flying Handbook recommends a level, accelerating departure, from a "pinnacle." For the purposes of this discussion, we can consider a roof-top pad a pinnacle. The technique is known as "airspeed over altitude." "A pinnacle takeoff is considered an airspeed over altitude maneuver which can be made from the ground or from a hover. Since pinnacles and ridgelines are generally higher than the immediate surrounding terrain, gaining airspeed on the takeoff is more important than gaining altitude. As airspeed increases, the departure from the pinnacle is more rapid and helicopter time in the “avoid” area of the height/velocity diagram decreases. [Figure 10-10] In addition to covering unfavorable terrain rapidly, a higher airspeed affords a more favorable glide angle and thus contributes to the chances of reaching a safe area in the event of a forced landing. 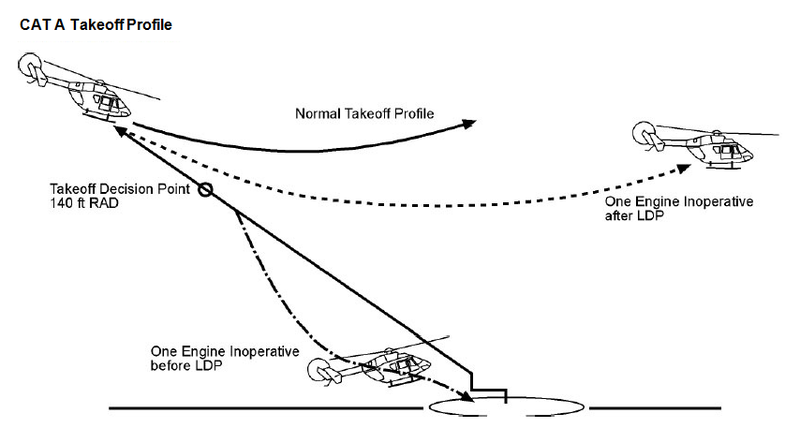 If a suitable forced landing area is not available, a higher airspeed also permits a more effective flare prior to making an autorotative landing." Are you confused yet? Why on earth would a company chief pilot or check airman teach a procedure that runs counter to the guidance from the FAA. Well, I think it has to do with different assessments of risk factors. If you fly over the edge of a rooftop pad at 5 feet and 5 knots, and the motor quits, you are going to be in a trick. This actually happened to a pilot in the Gulf of Mexico recently. His motor blew up just as he was leaving the elevated pad of an offshore oil rig. Had he performed a vertical liftoff, and the motor had done the same thing - gone bang - he would have spread his skids on deck, and he would be probably be alive. Let's change gears for a minute and consider approaches. That same HV chart applies on approaches, the airspeed and altitudes still matter. One large HEMS company directs it's pilot to make approaches such that the aircraft is in the avoid area for about 90 seconds every time they land off-airport. The descent down through the last 300 feet must be less than 200 feet-per-minute. That company wants the pilots to use a technique that runs counter to what the FAA manual says (apparent rate of closure of a brisk walk) and the reason is that they are more concerned with vortex ring state or settling with power and/or wire strikes. And it's their helicopter, and their operating certificate, and they sign the front of the paycheck. So their pilots make these painfully slow approaches or they are shown the door. So, when one pilot takes off one way, and another pilot takes off another way, who is correct? Well, as unsatisfying as this may sound, they may both be right. One may be following his own instinct, or company policy, or it may be the way his crew has asked him to fly. One guy may have had an engine quit on departure. The other guy may have lost a tail rotor at a high hover or is just worried about that - and he wants speed on departure as quickly as possible for it's streamlining effects. So in our humble opinion, what is the answer? Just talk to each other. Is it so hard to have a calm and rational conversation with the people we work with that we instead get angry and huff off to our little corner of the internet to write angry spiteful things about each other? Are we so territorial that we can't share our opinions and ideas with people who may see things differently? The other day, I noticed two different programs had helicopters on my hospital’s roof top helipad. What I saw was interesting. Two completely different takeoffs. It made me think and it also made me ask why? If I had to choose, I definitely knew which aircraft I would fly in….or rather, which pilot I would fly with. The gist of Dan’s blog was about flying defensively rather than taking it for granted that everything will be just fine between point A and point B. Most don’t fly thinking, “What if the motor quits?” It’s very similar to how many people drive down the roads as if nothing can happen or will happen. Maybe it's just me who drives a little defensively… maybe it’s simply too many traumas I’ve been to and cared for in my career that has made me who I am. I can tell you with absolute certainty and personal experience from the back seat of a helicopter that engines do fail catastrophically. I can tell you my pilot flew differently after that crash. And that he was a great pilot to fly with before that night. It’s just different after an experience like that. So back to the other day and the two drastically different takeoffs I witnessed. The first helicopter lifted, gained that 15-20 feet of altitude to simply clear obvious obstacles, and then did that drop-the-nose-down-while-flying-forward takeoff. A minute passed and the second helicopter lifted, turned slightly into the wind and then did a beautiful Cat A takeoff. I wondered what the pilot and crew in each helicopter were thinking. I hope the second crew took notice of the different takeoff next to them. I hope they discussed it post-flight. I find myself wondering if the first crew ever knew that what their pilot did was different or is it their normal takeoff? A normal takeoff from a safe helipad?? I wonder if the first crew was ever taught about takeoffs and landings. I wonder if they think engines will never quit. I hope they will speak up and ask. To learn more about "Category A" takeoffs - and landings - click here.